Image from the Herschel infrared Galactic Plane Survey in three different wavelengths: 70 microns (blue), 160 microns (green) and 250 microns (red). 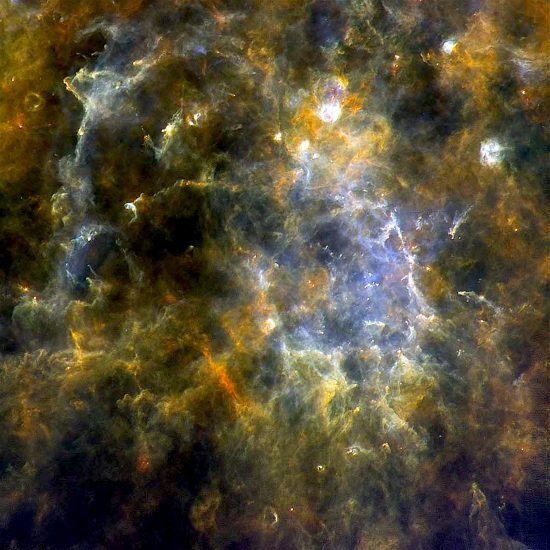 Credit: ESA/Herschel/PACS, SPIRE/Hi-GAL Project. Acknowledgement: UNIMAP / L. Piazzo, La Sapienza – Università di Roma; E. Schisano / G. Li Causi, IAPS/INAF, Italy. Click to enlarge. Even the coldest dust radiates light. The European Space Agency launched the Herschel Space Observatory on May 14, 2009 with the largest spaceborne mirror ever constructed. Herschel was sent into orbit around LaGrange point L2 in order to protect its helium-cooled infrared detectors. Its coolant system lasted about three years, so on April 29, 2013 Herschel’s mission came to an end. One of its most important discoveries was evidence for electric circuits in space, although that is not how consensus astronomers refer to their observations. They identified filamentary structures, some with bright cores. According to a recent press release, astronomers found that filaments with the greatest density are “unstable” and form “clumps of material bound together by gravity.” Those clumps are where consensus theories say new stars are born. In an Electric Universe, filaments of electric charge flow in closed circuits through plasma. Those cosmic electric circuits distinguish Electric Universe theory from conventional viewpoints. What mainstream physics calls, “mysterious” is readily explained when observations are coupled with laboratory plasma experiments. Gravity-based theories are impossible to model in the laboratory, on the other hand. Plasma filaments confirm those circuits. Celestial bodies are not isolated islands in space, they are connected across vast distances. Electric discharges in plasma create magnetic sheaths along their axes. Large-scale plasma discharges form coherent filaments that exhibit electrodynamic behavior. Gravity contributes to the evolution of stars and galaxies, but it is not the fundamental energy source. Double layers form in the sheaths when positive charges build up in one region and negative charges build up nearby. Electric fields develop between regions, accelerating charged particles. Electric charges spiral in the magnetic fields, emitting X-rays, extreme ultraviolet, and sometimes gamma rays. The cosmos is laced with those interacting circuits, each of them composed of untold numbers of twisting Birkeland currents. There are power-consuming loads in those circuits converting electrical energy into rotational energy. They are known as galaxies. Galaxies exist within the filamentary circuit of electricity threading the cosmos like power lines through a city. They should be evaluated according to electrodynamic principles rather than mechanical behavior.